Performance measurement is needed in any organization. 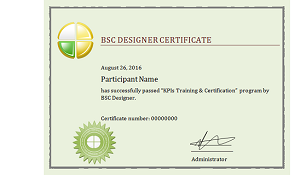 Proper KPIs help to focus business efforts on what matters, control costs, and share common vision across company.Join KPI Training and Certification by BSC Designer team, and get access to the time-proven system for KPIs. What is inside these blocks? If you are looking for more specific insights in strategy scorecards, or the onsite workshop designed specifically for the needs of your organization, then check out other available training options. Time-proven system to find best KPIs that are right for your business. This training can also be provided on the client’s site in the workshop format. Please, contact us for the details. The certification exam is conducted in the format of an online test. From a pool of cases we take 45 random questions. A participant has 60 minutes to answer all the questions. A pass level for the exam is 75% of the correct answers. In a case of successful test the participant will receive a certificate in PDF format. A certificate will also be mailed to the mail address of the participant. How this training is different from other KPI training that you can find on the market?